Built for super power, the Tanaka TCG22EASSLP gas powered lawn trimmer consistently starts on the first or second pull. We were impressed by how smoothly it runs, with few vibrations. Additionally, it’s lightweight enough not to be overwhelming, although some users recommend getting a harness. 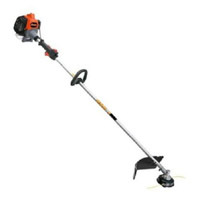 The trimmer works at all angles with no hiccups. The only design issues we found were the kill switch being in a position that’s easy to hit accidentally, and a lack of a notch or groove to make replacing the spool somewhat cumbersome.